All the blanket needs now is a baby to sit in the middle and coo. I have to say, I officially love crocheting blankets. It is SO FAST. 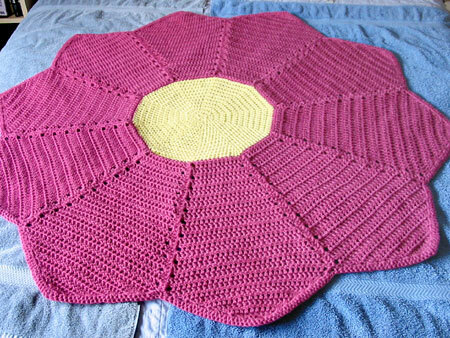 This blanket is about 44″ across and I finished it in about two and a half weeks (including ripping and re-crocheting 1/3 of the petals). 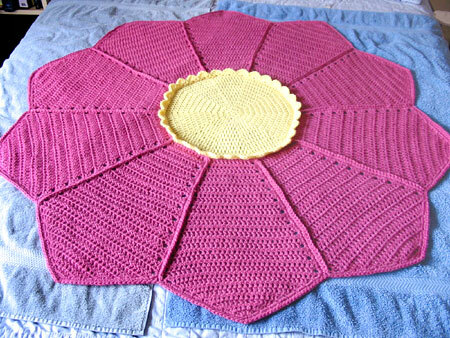 This is a very nice beginning crochet pattern and a very portable project. The instructions are clear and there are lots of photographs to help you figure out how to assemble the blanket. Although Encore is my favorite yarn for baby gifts because it is machine washable and dryable and comes in so many wonderful colors, I think this pattern would work best with a yarn that has more natural fiber. The petals are a little cupped when they first come off the hook and need to be blocked flat. The edging around the center also wants to point towards the middle and it needs to be blocked to point towards the outside of the flower. I think I could have managed to block them entirely flat with a natural fiber yarn, but Encore doesn’t block that well and my edging is standing up like a tart crust. The “wrong side” of the blanket is neat and tidy, which I appreciate a lot. Now to wrap it up and give it away! 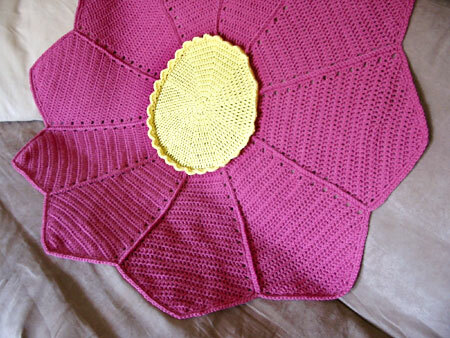 CogKnition posted this on August 30th, 2009 @ 2:54pm in Baby Items, Blankets, Crochet | Permalink to "Cobijita Floresita Baby Blanket"
THIS, this blanket almost tempts me to commit crochet. Almost. Wow, that is really great! I love the pattern and, though I love knitting more, may pick up the hook for this one.